In North Carolina, food insecurity affects 1.6 million people, or about 15.9 percent of the population (USDA 2017). Food insecurity is the lack of access to enough food for an active, healthy lifestyle for all household members; it also refers to the limited availability of nutritionally adequate foods (USDA 2017). Food insecure families often rely on food pantries or other food security organizations to supplement or stretch their food budgets. Many different types of people experience food insecurity. Some are individuals who work full time, including households with children; others are seniors and veterans. Increasing the availability of fresh, healthy, and nutritious food options at local food pantries can help improve the diets and health of food pantry clients, while also empowering them to make healthy choices. Strengthening connections between sources of local meat and produce and food security organizations also helps to reduce food waste, build community, and can benefit local farmers. This resource guide aims to (1) showcase successful programs that provide local meat or produce to food banks or food pantries and (2) highlight Cooperative Extension’s role and opportunities for collaboration. While this resource guide has useful information for anyone who wishes to facilitate donations of local food to food banks and pantries, we focus specifically on the role that North Carolina Cooperative Extension has played or could play. N.C. Cooperative Extension has a significant opportunity to increase farm to food bank donations by facilitating the relationship between growers, gardeners, food banks, food pantries, and donation recipients. This guide is part of the Local Food Publication Series and was made possible with funding from the Extension Local Food Program Team. Volunteers sort food at a food bank. 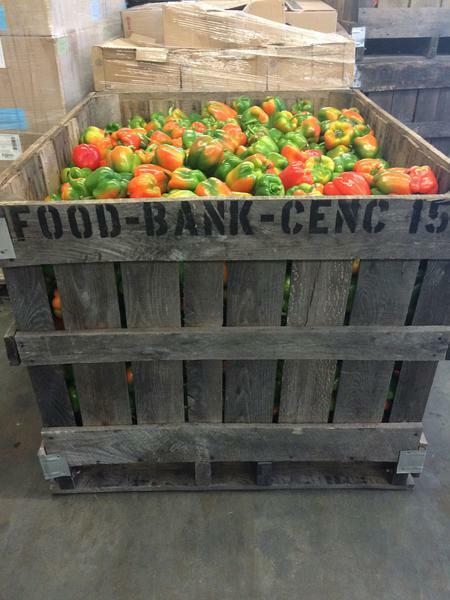 A crate of peppers at a food bank.